I almost called in sick for Greek Christmas this year. I know how Grinchy that sounds, but hear me out. Greek Christmas involves six children under the age of 7, six parents about Tony’s and my age, two grandparents, and Mama Greek. There is a lot of yelling – the good kind, but still. In the photos every year, I’m sitting on an armchair in the corner, amidst a battlefield of used wrapping paper, holding a glass of wine, and looking afraid. I was sure it would be the white elephant in the room. Word gets around in Tony’s family (when we got engaged, on the top of Mount Royal, our phone was ringing by the time we walked in our front door.) Most of the people who'd be at Greekmas know we’re trying, and those who don't must suspect. Sitting silently and awkwardly through kid talk and then getting the “So, how’s work?” question isn’t how I want to spend Christmas, or any day of the year, really. But if I’m the Grinch, my husband is a Who. By Christmas morning, he gets me into the spirit of the season. And I don’t want to spend the day without him. “I’ll go,” I tell him, over our traditional Christmas breakfast of Lucky Charms. “Then there’s something you need to know,” Tony says, quietly. Yup: another of the cousins is newly pregnant. (I know. It’s like the plague.) She and her husband won’t be there today, but there will be talk about it. Tony asks if I still want to go. I imagine spending the day feeling sorry for myself at the dog park, versus feeling sorry for myself with him, and cheesecake. I am nothing if not rational. Before we leave, we Skype with some of the cousins in Greece. I’m not sure if you’ve ever heard a Greek person on a long distance phone call, but you’d swear they were trying to make it so that the actual phone part is unnecessary. (Nonna Maria also has this issue, so I guess it’s not just a Greek thing.) Lest you believe this is an affliction of the elderly, you only need sit in on a Skype call between my husband and his cousins. Perhaps it’s passed down through the generations, like a good spanakopita recipe. I have to stand outside of the range of the camera in order to avoid ear ringing. “Tell them thank you for the gifts!” I say, meaning that Tony should translate this for the cousins. “THANK YOU FOR THE GIFTS!” Tony shouts, in English, at 10 times the volume. For the first time in our seven Christmases together, Tony doesn’t shave this year. His hair is a little long too, and when we go to pick up Mama Greek, from her reaction you’d swear he’d showed up with blood leaking from an open wound on his forehead. “Why you not tell my son to shave?” MG demands, in her “quiet” voice, which most of her neighbours can hear perfectly. “He doesn’t do everything I tell him to do,” I tell her. 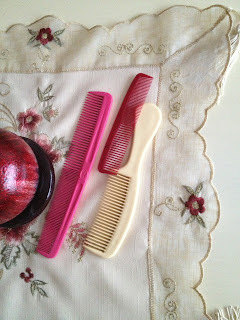 She frowns at me, then heads to the bathroom, takes 3 combs from the cabinet, and places them on the coffee table. She points them out to Tony, when he returns from the basement. “For your hair," she adds, in case there's any confusion. Tony stares at the combs for a minute, then takes a picture of them. I try to hide my laughter by shrinking behind my knees on the couch, but it’s no good. We get into the car, and I try to avoid the usual “you-sit-in-front-no-you-sit-in-front” song and dance by taking the driver’s seat. But Mama Greek is already drawn for battle. When Tony announces that he will sit in front, MG blows her top. En route, she frets constantly. Do I need to borrow her sunglasses? Are we sure we don’t want a candy? Watch out for that car, half a kilometer ahead! But when we arrive, everything changes. She enters the house first, to the Pavlovian shriek of 6 children, all of them primed for chocolate and cash. Tony and I go to follow her, and she shuts the door in our faces. The evening goes pretty well. There’s a lot of laughter, and a lot of dessert. I have to make some quick escapes, namely when excited discussion erupts about the pregnant cousin, or when Mama Greek tries to force-cuddle the kids one by one as they run by. But instead of feeling like an emotional basket case who can’t handle the truth, I give myself these moments, to sit by the fire and write festive text messages to friends, or wander around the quiet second floor, some of which is still decorated in perfect, shimmering 1970s glory. There is also a lot of talk about barfing, ear infections, and sleepless nights, and a lot of shrieking, crying, and refusal to eat turkey. “I’m ready to sell my son on eBay,” one friend texts me. I realize that the thought of going home to a quiet house to stay up late, eat popcorn, watch Christmas movies and the sleep until we feel inclined to do otherwise probably sounds like paradise right now to most people with kids. And so, that is exactly what we do. It is always great to us to read your stories of the Greek relatives. Believe it or not we have the same feelings even though we are 100% Greeks!! We wish you a Happy New Year and all the health and joy in life with your man. P.S. My mom still poses the same way to us! !